There…I said it. As if you didn’t already know. Contrary to what most traders think, the hard part of trading isn’t being right or wrong. Each of us will find ourselves in winning trades and losing trades at times – even random entries can produce (at least temporary) profits. Discomfort is the hard part. Our minds seem hardwired to shun (perceived) failure, so some traders struggle in a big way to close out a losing position and instead spend waste time hoping for a turnaround which may or may not ever happen. It’s uncomfortable for them to admit defeat and accept a small loss, so they usually pay big to try and avoid that. Our minds can also have recency bias , so after a string of losses, it’s tempting to book a winner – no matter how small – just to stop the bleeding and have a taste of success again. It can be uncomfortable to let open profits ride when you’re clearly on the correct side of a trade – what if you give them back?! You need this winner, right? That often leads to booking smaller gains as compared to what you were on track to get paid, and that adds up big over the course of your month, or your year, or your career. Discomfort can also be tied to our preferred trading timeframe. 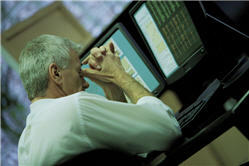 Some can’t stand the erratic price action found on the intraday charts, and they tend to respond with late or forced entries when day trading. They get spooked out of good trades, opting instead to focus on the most recent 5-minute bar rather than the overall direction that’s taking place. Others can’t stand to give a stock an appropriate amount of wiggle room when swing trading, so they choke off what would be a good trade in favor of a stop that’s too tight. Instead of positioning themselves smaller in order to weather the short-term shake-outs, they essentially overtrade by reacting to insignificant moves within the context of a bigger trend. Profits aren’t allowed to pile up, and their skittish approach keeps them frustrated by the big moves they were once a part of but missed out on. Risk involves discomfort, so if you’re constantly avoiding discomfort, you’re avoiding risk – and by definition, risk must be taken in order to profit in the markets. The key is to manage that risk  appropriately, which also means managing your discomfort appropriately. There’s no getting around discomfort in trading. Everyone has it, regardless of directional bias or timeframe preference or the market being traded. Either you’re uncomfortable with the results you’re getting (e.g. overtrading, not sticking with good trades, staying too long in poor trades), or you’re going to face some discomfort while denying yourself as you stay with a good position. That’s going to include enduring pullbacks, watching some profits evaporate, and being patient while waiting for an acceleration move to occur. In an instant-gratification society like ours, it’s no wonder most traders fail. Have the courage to choose your discomfort ahead of time, so that by expecting it and mentally rehearsing  what you’ll likely face, you’ll in turn be able to respond with good decisions.